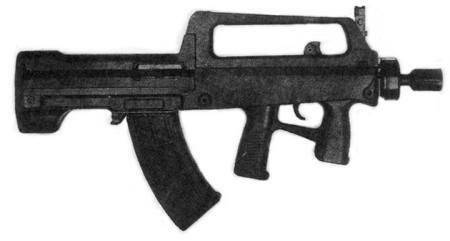 The NORINCO QBZ-95 ASSAULT WEAPONS SYSTEM is a bull-pup family of weapons chambered for the "mysterious" new 5.8x42mm-Chinese ammunition. This probably, a modification of the classic 5.75-Russian cartridge, with a penetration coefficient increased. You can see the difference between this and the pic of the QBZ97 because of the different magazines. It has a S-E-3-F trigger group and is NOT employable by left-handed personnel, althrough it can fit all either STANAG or chinese optionals, such as grenade lauchers (the USA M203, but also a chinese copy of it), 4x optics, scopes (see the various pics posted along). This weapon was seen for the first time in the hands of the chinese troops in Hong Kong, but it shortly thereafter entered service qith the Chinese Army Special Forces, and it will soon replace the AK47 with all the chinese troops and police. The QBZ-95 ASSAULT WEAPONS SYSTEM along with the QBZ-95, features 3 other weapons: the CAR-95 (a carbine version of the QBZ-95), the KBU-88 (a semi-auto sniper rifle), and the QBB-95 (a Squad Automatic Weapon). All of them come chambered in the 5.8x42mm-Chinese ammunition, and the CAR-95 and QBB-95 have the same S-E-3-F as the QBZ-95.